It was perhaps inevitable the Pet Shop Boys would move into the world of ballet, as they do with a score based on the Hans Christian Andersen story The Most Incredible Thing. Inevitable as three of the strongest elements of their career to date are brought into sharp focus. The first is a long held aptitude for making people move. Cast your minds, ears and dancing feet back to West End Girls, and pretty much every year for the last 25 since that, and you have a Neil Tennant / Chris Lowe track tailor made for the disco at the very least. The second is their affinity with writing for bigger instrumental forces. One of the most impressive things about their early hits was their mastery of the orchestra, however much of it was synthesized, and the power chords of It’s A Sin and Always On My Mind showed them at ease with the integration of instruments and electronics. Thirdly, and perhaps most importantly, is their undisputed talent for putting on a show. 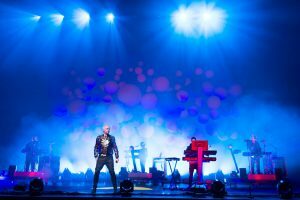 Anyone who saw their touring stage set up during 2010 could not fail to be impressed with the choreography, the lighting and the arrangements of the tracks, all complimentary to the fully entertaining whole. It is this last discipline that unfortunately highlights the missing element from the audio score, for The Most Incredible Thing can often leave the listener missing that most important visual dimension. For sure there are plot signposts, when themes transfer unexpectedly from floated euro trance to orchestral swing, but without a synopsis or a visual guide these transfers can prove unsettling and sometimes clunky. That said, there is some music of great beauty here. The silvery waltz theme with which the light footed Risk is characterised is both beautiful and memorable, its reappearances almost always a pleasure, its sudden transfer to heavier electro pop later in the track less so. There are other themes of strong identity, and with the help of Sven Helbig the orchestrations are most impressive, performed with great verve by the Wroclaw Symphony Orchestra. It is clear Tennant and Lowe have spent a lot of time with this score, which they began to compose in 2008, for the separate numbers flow easily within the larger structure. They are at their most effective when the delicacies of the scoring can be revealed, and the occasional sudden side steps into pop, electronic and trance are in the main well handled. Tennant sings just the once, during The Challenge, and if you blink you’ll miss it – though this perhaps inadvertently highlights what is missing rather than what is there. The solution, then, is to go and see the ballet live, to witness the story unfolding before your eyes. Then the shifts that seem uncomfortable on the recording of the bare score will become more logical, the colours of the orchestra will doubtless bear fruit through the choreography, and the music will get the chance to fully tell its story. For the tale is only partially told here – which, when you compare The Most Incredible Thing perhaps unfavourably to the great ballets of the 19th or 20th centuries, is the one thing most obviously lacking. For now we should admire the abilities of Tennant and Lowe to move from structures of four minutes to those of an hour and a half, and hope this encourages them to continue in a form in which they have made a very listenable start.